After hearing and speaking to a large number of nurses and practitioners that had skin problems due to repeated use of alcohol on their hands, we set out to make a natural anti-bacterial cleanser that protected the skin. We spent 2 years experimenting and trialling a variety of natural blends and carriers before we achieved the results shown below for cleaning hands. We started with a moisturising base of Aloe Vera and Natural Vitamin E. We then added a blend of 5 different essential oils. Make sure all “organic” matter is removed (dirt) and massage the cream onto the hands. Ensure you get both the tips and in between the fingers. Rub until absorbed, it’s as easy as that! Aqua (H2O's Fancy Name), Thymus Vulgaris (Thyme) Oil, Aloe Barbadensis Leaf Juice (Aloe Vera), Sclerotium Gum (Food Grade Thickener), Melaleuca Alternifolia (Tea Tree) Oil, Citrus Sinensis (Orange) Oil, Piroctone Olamine (Olamine Salt), Tocopherol (Natural Vitamin E), Citrus Limonum (Lemon) Oil, Rosmarinus Officinalis (Rosemary) Oil, Acetum (Apple Cider Vinegar), Humulus Lupulus (Hops) Extract . Aqua (H2O's Fancy Name) Gathered from dew off petals of organic roses, our energised water. Hmm we just can't do it! We use purified and demineralised water as thecarrier base for the other ingredients. Aloe Barbadensis Leaf Juice (Aloe Vera) Aloe Vera is a flowering succulent plant that stores water in enlarged fleshy leaves, stems, or roots. Sclerotium Gum (Food Grade Thickener) Sclerotium Gum is a natural food grade thickening agent that promotes hydration of the skin and the product itself. It also helps to stabilise the emulsion of other ingredients in a product. Citrus Sinensis (Orange) Oil Orange Oil is extracted from the peel of the fruit. it’s packed with powerful antioxidants. Tocopherol (Natural Vitamin E) We use the more expensive natural Vitamin E in our creams, not synthetic. Natural Vitamin E has a light brown colour so discoulours products a little. It also has a distinctive scent. However Natural Vitamin E is much more bioavialable than synthetic Vitamin E.
Rosmarinus Officinalis (Rosemary) Oil Rosemary oil is extracted from the plant Rosmarinus Officinalis. It is commonly used for its purifying and cleansing properties. It’s a calming and soothing oil for the skin when diluted. Acetum (Apple Cider Vinegar) We use this as a pH adjuster. We have made 2 sizes. 270g for home or work and a 100g travel size. (Most travellers know one of the best ways to avoid getting sick is to wash the hands before eating or drinking). Received my sample of the hand anti-bacterial and have been using it regularly since I got it. Sorry we have taken so long to reply but we wanted to see how the moisturiser went on my daughters hands if it stopped the skin peeling. It has been excellent on her hands. It hasn't been as irritating on her skin at all! 1. How did you find the feel on your hands? With multiple uses? Worked really well no issues with multiple uses. 2. How did you find the scent and overall wearability? One comment is that it is a quite strong tea tree smell people actually commented on the smell. It is a little bit sticky on your hands when you first put it on but dries fine. 3. Would you prefer this anti-bacterial to the one you currently use? Yes I would prefer this to my current one as it is not as harsh on my hands. 4. And any other information you’d like to share. It would be really useful to have it in a small (refillable) pocket size bottle that I could access easily. I would definitely buy this product! Sorry for the delay in replying. I have loved using the anti-bacterial in the last couple of weeks. I find the scent pleasant but most importantly it doesn't dry my hands out and it doesn't sting on cuts/broken skin! It's a good thing you told me it would be sticky on application as it was the first thing I noticed, but the stickiness disappeared very quickly and I haven't found it to be a problem. I would most definitely use this instead of an alcohol based anti-bacterial and so would my nursing friends and family who have tried it as well. Looking forward to when it becomes available on the shelves! Our household, three people, have been testing this for you and we have the following to report back. How did you find the feel on your hands? With multiple uses? 1st application it felt a bit strange. The more we all used it ( especially my sister and myself) we loved it. My niece is going to be a nurse and liked it better thank the ones in the hospitals now. How did you find the scent and overall wearability? It smelt a little bit funny the first use. My sister and I liked it, my niece did not... Suggest a vanilla sent if this could be possible. Would you prefer this anti-bacterial to the one you currently use? And any other information you’d like to share. Need to have the dispenser made for appropriate measuring... If it is too much it goes very sticky. My hands felt softer than using an alcohol based antibacterial gel. Even with multiple uses, I felt my hands were still softer than before. It was like putting on a mild hand cream. The scent is very pleasant, a lot easier on the nose than other antibacterial products. I found my hands were actually softer after using it. I only noticed the stickiness as I was rubbing my hands but once it dried, there was no stickiness at all and my hands felt lovely and smooth. It would be easier to use this product in a pump pack as you have to pick up the bottle to squirt the gel onto your hands. This means that the package becomes contaminated with the germs we are trying to get rid of. If you can put it in a pump pack, you could use the back of your hand or elbow or arm to pump without contaminating the packaging. Hope this feedback helps, please let me know if you need anything further or if you need me to clarify anything. I would be very happy to purchase this product if it went into production. You should definitely take this product into production! It's amazing! It is so easy to use and it feels and smells beautiful. I've been using it up to 10 times a day and usually I would have dermatitis from the usual hand anti-bacterial, but I've not even got the faintest trace of an itch. Have shared some with a Dr friend and she also loved it! Would definitely buy this product to add to my ever-growing moo goo stash! Thanks for letting me try it! I only received it on Friday and at first I thought that it was sticky but then it went away almost instantly. I also was a bit put off by the smell at first but when I thought about it I would much rather that smell (which I now actually like) than the strong alcohol smell from the other hand antibacterial gels. I will definitely use it over my current one. I have no concerns touching my daughter straight after rubbing it on my hands. I am very impressed by it and would love to see it as a permanent product. I am going to show everyone at work how good it is as well. Hopefully we can get permission to use it instead of the current alcohol rub as we are always touching babies and the more natural we can keep it the better. Their skin is so fragile at birth. Thank You for giving me this opportunity! Thank you for allowing me to road test this new product from MooGoo, I'm very excited about this addition to the high quality products already delivered within the current skin care range. I have been using the Anti-bacterial Hand Moisturiser for a week now at work and at home. I have found I like to keep it in my hand bag while I am on the go. I am surprised how light the product is, and the smell is not overbearing and the scent is clean and fresh, just the way you want to feel. It does certainly live up to its name as being moisturising, as my hands feel less dry and more smooth. I can certainly see I can easily use this product multiple times a day and my hands will not suffer or dry out. The scent is a touch stinging to the senses only the very first time I used it, but does fade into a nice clean fresh smell as you rub it into your hands. I especially love how it goes into your skin quickly and does not leave a sticky feeling or residue. I feel as though I have thoroughly washed my hands and applied a very good hand cream, but in one simple easy step. It feels like my hands have been sanitised, without the harsh alcohol scent or roughness you can experience afterwards with other brands. I am preferring this product, as it makes my hands a lot smoother, hydrated and soft. The bottle is the perfect size to have in hand bag, office drawer, nappy bag etc. You also do not have to use a lot, so I can see it will last. Again, I feel as though I have thoroughly washed my hands and applied a very good hand cream, but in one simple easy step, something I don't feel with other hand anti-bacterials I have used or currently using. The way the product is released from the bottle is excellent. Not too much comes out in one application. Clean and simple and can do so one handed if needed. I am becoming a mother for the first time very soon, and excited for the product to add to my nappy bag and will like to see it added to the current range very soon. I am also happy to become involved with any Marketing or online promotion of MooGoo products as a mother, and for use on my baby. I am very conscious what I use on myself, and what I have been using throughout my pregnancy, and I think this will only continue once my baby is born. Again, will like to see it added to the current range very soon, as I can see it as being a staple item in the nursery, hand bag and nappy bag. My friends will be excited about it too, as there seems to be other 'natural' products on the market that either still have too many chemicals, or leave your hands feeling wet, sticky and dry. Thank you again for allowing me to test this new product. I have been using the hand anti-bacterial and thought I'd share my thoughts on it. Overall I loved it. I found it felt very pleasant and not sticky after numerous applications in an hour period. I also found that a little went a LONG way so only one pump was needed. I also found that when I got around to washing my hands with soap and water, there wasn't much of a film on my hands like there normally is with the other hand anti-bacterials I use. I am a district nurse in the community and we are provided with [another brand] hand anti-bacterial and we use this ALL day and I really struggle to use this more than 3-4 times in a row as it becomes very unpleasant and sticky on the hands. Your Moogoo one was much much nicer and I would prefer to use this instead. The only thing that I didn't quite like was the scent, I found the t-tree scent quiet strong and would prefer another scent if the option was available. (But I generally don't like the t-tree smell so others may not have a problem with this). I found I could smell the scent on my hands for quite a while after using it. I would purchase this as my preferred hand anti-bacterial however I would also prefer for it to be made into a smaller bottle so it is more hand bag friendly. These are just my thoughts. Thank you for sending me the hand anti-bacterial. I really did like it overall! Thanks very much for your email and thank you for the opportunity to be a testing bunny for MooGoo. I am emailing to provide you guys with some feedback on your new Antibacterial Hand Moisturiser. It is fantastic! I am an eczema sufferer and I always have dry, cracked hands and fingers. It is sensational that MooGoo have formulated a hand anti-bacterial which is alcohol-free and won't leave me with any stinging or burning when applied to my skin. Your hand anti-bacterial feels wonderful on my hands and causes no pain on my damaged skin whatsoever. I find the scent of it to be very strong, however it is not a bad scent and is actually quite lovely. I would definitely recommend your hand anti-bacterial to people with skin issues as it is a fantastic alternative to the usual anti-bacterials which contain alcohol and burn your skin. 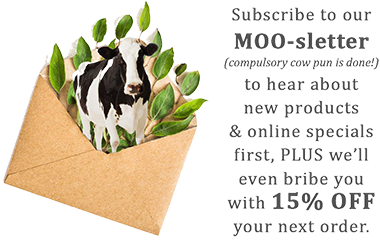 I really do hope that MooGoo goes into production and I look forward to seeing your hand anti-bacterial available for purchase. I received my antibacterial moisturiser on Friday after searching what seemed like the entire hospital for it. Even with tracking it somehow went awol! So my apologies for taking so long to test it out and get back to you. First thing I noticed and everyone else was the smell. Unfortunately it's not that pleasant. I wouldn't mind it so much if the smell dissipated after it dried on my hands but it lingered permanently and was overpowering to everyone in the room. Only one person said the smell was starting to grow on her hehe. The feel of it was great, and everyone who used it commented on how nice it felt also. I thought it felt moisturising enough and it was quickly absorbed into the skin and didn't leave any residue on my hands or that slippery feeling after using normal hand moisturisers. This is perfect for medical staff who are too busy to wait for moisturisers to dry on their hands. Probably didn't dry as quickly as the alcohol gel we have though, but not too far off. After multiple uses I didn't find my hands were any more moisturised than normal but they certainly weren't dry from constant use like with the alcohol gels we have. So big tick there. I would much prefer to use this antibacterial moisturiser over the alcohol ones we have in the hospital but the only thing putting me off is the smell. Especially when I like to wear nice perfume everyday as it's just too overpowering. Thank you so much for allowing me to be a testing bunny for your new Antibacterial Hand Moisturiser. I was thrilled to receive the sample. Over the past two days it has been trailed by 8 people at 2 different work places. I firstly used it at a school environment with my staff and asked for their feedback after use. All staff were females and the feedback was very similar. All staff mentioned a sticky residue feeling after use. Many mentioned having to wash hands after use. Even with multiple uses staff were not pleased with the feel. All noticed a strong scent. Comments like "smells a lot like tea tree", "that's too strong", "Like Pinetarsol" were common. All staff preferred other brands scents. Would you prefer this anti-bacterial to the one you use? Unfortunately no one preferred this to the one used in this workplace. All staff mentioned that is was fine on their dry hands. None mentioned having to wash hands after use. Even with multiple uses staff were pleased. All still noticed a strong scent. They all really liked it and thought it was a masculine scent. One thought it was on par with what they use and two felt it was a superior product and hands were much softer after use. I found this very interesting feedback and hope this assists your herd. Thanks again for the opportunity. Thanks for sending a sample of the antibacterial hand moisturiser. Everyone at my place of work has tried it & most of us were really happy with it, there was only one person where it effected his eyes for some reason but he has the same problem with the other hand anti-bacterial also. He doesn't put it in his eyes, i think its just the fumes that come from it. The rest of us liked how it felt on our hands, we liked the tee tree smell. It didn't dry our hands out like the other brand & it didn't sting our hands if we had cuts or scratches. It was wonderful, I would personally use it over the other brand that we have. Hope this feedback helps you out. Its a great product, but then again I love all your products. The product felt comfortable on my hands, with plenty of ‘slip’ in the product to spread it around. The smell of the essential oils was pleasant when initially applied and doesn’t linger, so does not interfere with perfume or other fragrance that may be worn. When testing, I applied the product very frequently, several times an hour. The moisturisation from the product isn’t as obvious as applying a hand moisturiser, but is definitely moisturising in comparison to standard hand anti-bacterials which dry out my hands. The Moogoo product left my hands feeling comfortable and not dried out, so I didn’t have to reach for a moisturiser everytime. Nor did the product ‘build up’ on my hands when using it frequently. I definitely prefer the Moogoo product over a standard hand anti-bacterial and will purchase this product. Thank you for the opportunity to test this product. Thank you for sending me the hand anti-bacterial to try out. I believe it got here on Saturday, though I saw it Sunday morning, November 30th. I've been bringing it with me to work. I wear cargo pants as part of my uniform & I'm happy the bottle fits in my side pockets. I wash my hands frequently & I can say I use the hand anti-bacterial around 8 or 9 times a day. Smell- it has a strong smell. The strongest note here is tea tree oil. I understand tea tree oil plays a big factor in this formula, but I'm not crazy about the smell. I was buying food at the food court & the server told me, "did you put Vicks on? You smell like you have it on" I didn't realize she could strongly smell it though she was a few feet apart from me. So far, these are my observations with this. I'll give you more feedback soon. I loved that you only have to use a small amount to get good coverage. I was also impressed that it dried so quickly and my hands felt very soft afterwards. I do have eczema on a few of my fingers. This flares up quick badly after I have been at work and repeatedly washing my hands (chlorhexidine type hand washes). Sadly this product didn't resolve the eczema, but it did reduce the severity. Initially I found the scent odd. I couldn't quite identify what it was. But it wasn't over-powering and you quickly get used to it. It is definitely more appealing than the other alcohol-based hand sanitising gels! Most definitely. The ones I have access to at work are so very drying and smell awful! I really liked the pump action bottle and found it really easy to use. Thank you so much for giving me the opportunity to trial this product.